Video of employees from a Chinese company specializing in beauty products who were forced by their bosses to crawl a long distance on a busy street went viral last week, sparking global outrage at the appalling display, which further happened to involve a nearly all female staff. Screenshots of the viral video showing corporal punishment for employees in Shandong province. 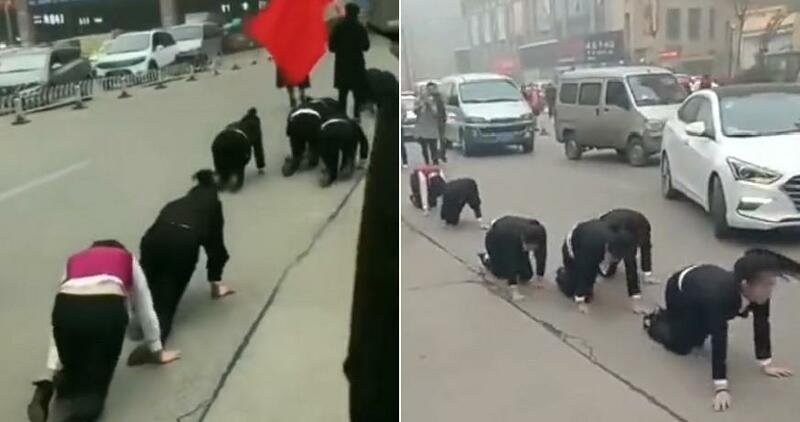 The workers were literally forced to crawl on all fours after reportedly failing to reach their annual sales targets in the busy traffic of Tengzhou — a city in Shandong province in the country's east. The group was filmed being driven on by a male supervisor bearing a flag with the name of the firm, which reportedly disrupted traffic. Onlookers called the police, which soon arrived on the scene and warned the boss it must cease the punishment, as China has laws forbidding corporal punishment or acts of intentional public humiliation for workers; however, in recent years there's been an observable trend that companies are increasing such bizarre tactics, which has involved everything from whipping to forced worm eating to caning. Last month, workers at a Chinese hair salon were forced to slap themselves in the face 100 times, eat raw chillies and run 10km because their work performance hadn't reached their boss's expectation. In November, employees at a home improvement firm in Zunyi, Guizhou province, were whipped with belts, forced to drink urine and eat insects after failing to reach their targets. But few such shocking acts have been filmed (with some notable exceptions), which has led some skeptics online to suggest this week's forced crawling spectacle could have been a PR stunt. But if so it appears to have backfired as the company has reportedly been temporarily shut down. One of the women forced to crawl the long distance confirmed to police it was a “self-discipline measure” for missing end-of-year targets, according to reports. In a similar incident last May — though perhaps less public as it wasn't in the middle of a busy intersection — video emerged from a monthly appraisal session in Yichand in central Hubei province. The South China Morning Post reported at the time that a female boss slapped six male workers multiple times in what appeared a bizarre ritual to boost lagging morale. At the close of the ordeal, the employees were all forced to clap. During that event, as well as this week's abuse incident, the companies claimed that staff members were willing participants in their punishment.